The campaign, celebrated each year during the month of March, focuses on the importance of making informed food choices and developing sound eating and physical activity habits. 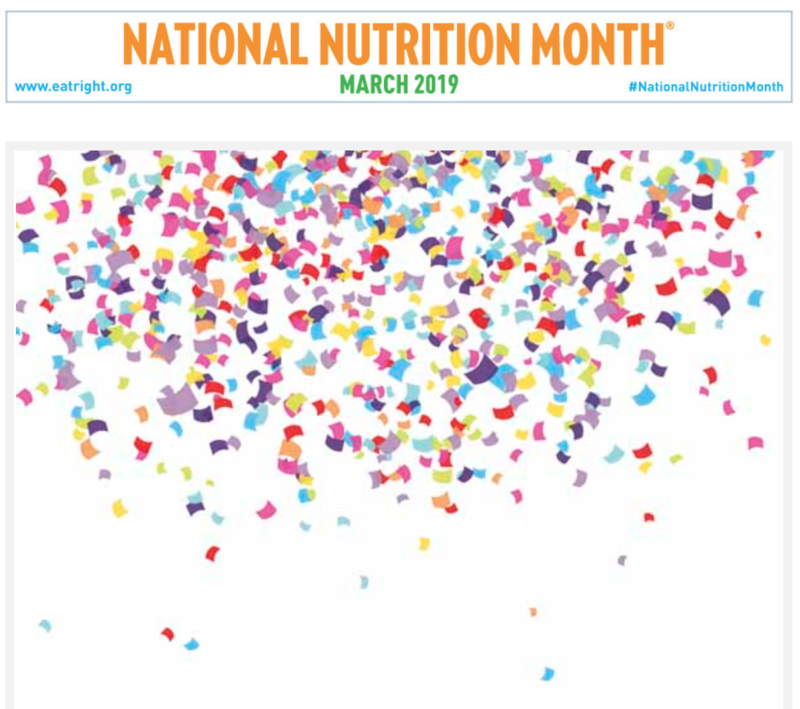 In addition, National Nutrition Month® promotes the Academy and its members to the public and the media as the most valuable and credible source of timely, scientifically-based food and nutrition information. That’s great news! We could all use a little boost in the world of nutrition and health, right? Unfortunately, many of us are rather confused as to what “healthy” and “nutritious” actually mean. The truth is that there is no one diet that works for everyone. There is no magic pill or regime that will give us our dream bodies overnight. What is healthy for you, physically and mentally, may be a far cry from what is right for me. Thus, it’s important to follow a healthful eating plan that is packed with nutritious and tasty foods that keeps each person’s individual lifestyle and unique palate in mind. And, this “diet” (better termed as eating lifestyle) must be sustainable – meaning, it needs to be something you/we/I can do long-term. Well, for some, those who desire a mindless transition to health, the lack of a specific program or pill is a little heartbreaking. For others, this level of flexibility is so freeing! This lifestyle term is actually a level of “intuitive eating,” Listening to your body, thinking about what it needs in the present moment vs. what the media tells us we need, and assessing our levels of hunger, fullness, and our cravings – WHAT FEELS GOOD – is the answer. (Or part of it). Imagine this: you’ve been craving ice cream for three weeks straight but have been denying your body the treat because it’s too high in sugar, too high in fat, and just too “unhealthy.” At some point, you lose all willpower and pull over to the nearest Baskin Robbins and devour an entire gallon of Peanut Butter Chocolate Chip ice cream in a matter of minutes. Ugh. You certainly don’t feel great now. That was not a great solution and beyond your means of willpower. You can only resist so long. What would feel better would be to have a scoop or two of ice cream each time you have the urge (yes, moderation) and sit with how the two scoops make you feel physically and emotionally. Enjoy the food, as you are directed to enjoy life. That’s what lifestyle is. And, guess what, it may feel really, really good to eat a big salad for dinner a few hours later! Just think about it…or rather…feel it. (Yes, the second part of the solution is to eat mostly plants and everything else in MODERATION – oh, and the third part is to move your body a little too). All of this sounds familiar. In fact, it sounds like a dose of Mindfulness. It seems like Mindfulness may be a good thing in relation to food and nutrition too! Imagine that! Happy Nutrition Month! Be good to yourself and eat your heart out, intuitively, of course!